-One of a race of monsters having the head, torso, and arms of a man, and the body and legs of a horse. 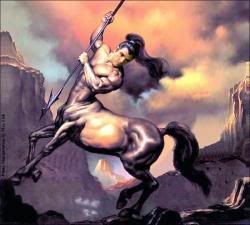 In Greek mythology, the centaurs (Greek: Κένταυροι) are a race of creatures composed of part human and part horse. In early Attic vase-paintings, the head and torso of a human joined at the (human's) waist to the horse's withers, where the horse's neck would be. This half-human and half-animal composition has lead many writers to treat them as liminal beings, caught between the two natures, embodied in contrasted myths, of centaurs as the embodiment of untamed nature, as in their battle with the Lapiths, or conversely as teachers, as Chiron. Centaurs are said to be extremely heavy drinkers, and were usually depicted as beasts of Dionysus. They were thought to carry bows and are very short tempered creatures.